How fictional representations of dead bodies develop over the twentieth century is the central concern of Lisa K. Perdigao's study of American writers. Arguing that the crisis of bodily representation can be traced in the move from modernist entombment to postmodernist exhumation, Perdigao considers how works by writers from F. Scott Fitzgerald, William Faulkner, Willa Cather, and Richard Wright to Jody Shields, Toni Morrison, Octavia Butler, and Jeffrey Eugenides reflect changing attitudes about dying, death, and mourning. For example, while modernist writers direct their plots toward a transformation of the dead body by way of metaphor, postmodernist writers exhume the transformed body, reasserting its materiality. Rather than viewing these tropes in oppositional terms, Perdigao examines the implications for narrative of the authors' apparently contradictory attempts to recover meaning at the site of loss. 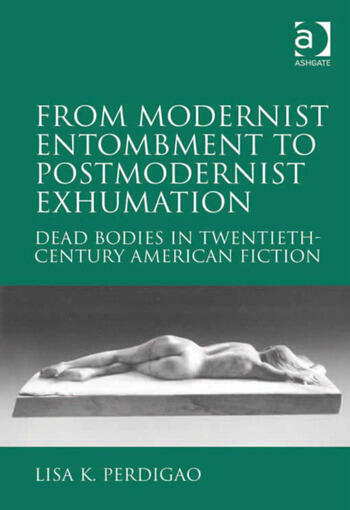 She argues that entombment and exhumation are complementary drives that speak to the tension between the desire to bury the dead and the need to remember, indicating shifts in critical discussions about the body and about the function of aesthetics in relation to materialized violence and loss. Lisa K. Perdigao is Associate Professor of English at the Florida Institute of Technology. She is co-editor, with Mark Pizzato, of Death in American Texts and Performances: Corpses, Ghosts, and the Reanimated Dead (Ashgate 2010), has published articles in book collections on Adrienne Rich’s poetry, Toni Morrison’s fiction and prose, Caribbean women’s writing, and children’s and adolescent literature, and has an article forthcoming in the MLA collection on teaching William Faulkner’s As I Lay Dying.